An entire day of exciting on-the-mat action. Auctions of one-of-a-kind wrestling collectibles and other must-have treasures. It’s all for fun … and for a great cause. It’s the 12th annual Wrestle Against Autism fundraising event, to be held next Sunday, April 14 at the Otterbein University Clements Campus Fitness and Recreation Center in Westerville, Ohio just outside Columbus. The 2019 Wrestle Against Autism tournament is a fundraiser to assist individuals who have been diagnosed with autism. Proceeds from Wrestle Against Autism go to purchase laptops and other learning tools; in addition, another primary benefactor of the event is 4 Paws for Ability, a Xenia, Ohio-based organization that provides service dogs for individuals on the autism spectrum. The 2019 Wrestle Against Autism tournament is expected to attract approximately 300 wrestlers, ranging in age from six to 30-something. If the past is any indicator, the majority of participants are high-school age wrestlers. Eleven mats will be ready for action, “ten of them going full-blast,” according to Sitler. In addition to ticket sales, entry fees and donations, Wrestle Against Autism also raises funds through auctions held at the tournament. Among the unique wrestling-oriented items up for bid: a Dan Gable-signed singlet, t-shirt, poster and photo … a unique Vision Quest singlet donated by Frank Jasper, the man who played Brian Shute in the classic 1980s movie … an autographed pair of RUDIS Kyle Snyder shoes, signed by the three-time NCAA heavyweight champ for Ohio State who is also the youngest Olympic gold medalist – and youngest World Champion — in American wrestling history.. a.handcrafted “puzzle piece” afghan (puzzle pieces being a symbol for autism) … and a quilt made from t-shirts from past Wrestle Against Autism tournaments. In addition, a lucky winning bidder will receive a custom-made 10′ x 10′ Resilite wrestling mat. Auctions will take place during the tournament on Sunday. Wrestling fans unable to make it to the Wrestle Against Autism event in person can place bids online by sending bids by private message on the Wrestle Against Autism Facebook page direct to Jeff Sitler by end-of-day Friday. If that weren’t enough, realize that all auction items have been donated … and all proceeds from the event’s auctions will go to benefit efforts to serve those on the autism spectrum and their families. In addition to unique items up for auction, the 2019 Wrestle Against Autism event will have items available for sale, including the brand-new “Giant Killer: The Carlton Haselrig Story” about the six-time NCAA heavyweight champ who went on to an impressive NFL career with the Pittsburgh Steelers. Each year, the Wrestle Against Autism event attracts some big-time guests. This year is no exception. 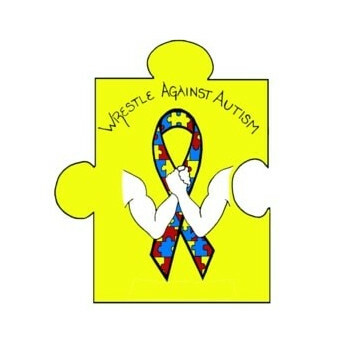 Among the guests expected at the 2019 Wrestle Against Autism include Jimmie Bell, defensive lineman for the 1997 Rose Bowl champion Ohio State Buckeyes, who is now a media analyst and motivational speaker … and Mike Hoover, Director of The Make It Fit Foundation, dedicated to improving the lives of those affected by autism by developing and maintaining a community of caring, unified, and knowledgeable individuals dedicated to raising money for autism research, treatment, advocacy, education, and family services. 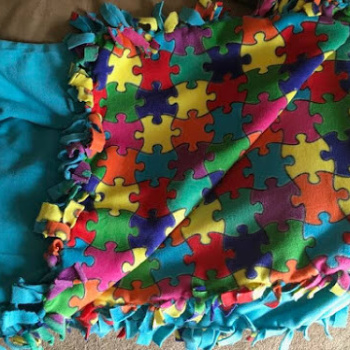 The organization’s name and symbol is built on a puzzle piece, which has become the symbol for autism awareness. Make It Fit aspires to “fit” the missing pieces together to help bring about more research, better treatment, and ultimately a cure for autism. If all that weren’t enough, this year’s Wrestle Against Autism tournament promises to have great on-the-mat action, with wrestlers from Ohio, Pennsylvania, Michigan and other nearby states. There will be seven age-based divisions of competition for boys and girls, ages 6 through high school, along with competition for post-high school wrestlers and seniors 30 years of age and older. Rumor Roundup: Roman Reigns appearance, Braun Strowman, backstage at SmackDown, more!